The gunman allegedly fired at police during a chase, then entered the store and took hostages. He later surrendered. LOS ANGELES — A man suspected of holding dozens of people hostage at a Trader Joe's store, resulting in a woman's death, was being held on $2 million bond and is expected to be charged with murder, police said Sunday. Police said the woman was killed Saturday after the suspect, identified Sunday as Gene Evin Atkins, 28, got into a gunbattle with pursuing officers, entered the store in the Silver Lake neighborhood of Los Angeles and engaged in a three-hour standoff before surrendering. Officials identified the woman who was killed as Melyda Maricela Corado, 27. After being shot and as the situation was ongoing, she was pulled away from the scene by police and treated by Fire Department medics but did not survive, Mayor Eric Garcetti said. Ambulances sent six people to hospitals, and a seventh person who was cut by flying glass took herself in for treatment, authorities said Sunday. None of the injuries was life-threatening. The suspect, wanted for allegedly shooting his grandmother, fled in his grandmother's vehicle while being chased by police. He fired at officers during the pursuit before crashing the vehicle near the popular grocery store. He then entered the business with as many as 50 people inside, Garcetti said. The gunman took more than 40 employees and customers hostage, police said Sunday. During the standoff, people were released or escaped the building, and the suspect eventually surrendered by asking police for handcuffs, putting them on, and then exiting the store with several other people at around 6:30 p.m., the mayor said. "We are very early in this investigation," Los Angeles police Chief Michel R. Moore said. He said it is believed that the woman was shot in the initial moments of the suspect exiting the vehicle and getting into a gunbattle with police in pursuit at around 3:30 p.m., and it wasn't clear if she was shot by the suspect or in the gunfire exchange with police. A police spokesperson said that the woman was an employee of the store. Throughout the more than three-hour standoff, "There were hostages both released and saved by the LAPD," Garcetti said, and he praised police for their actions during the ordeal. Moore said police helped those trapped inside escape through other exits as the situation was ongoing. No officers or first responders were injured, police and fire officials said during a news conference. Moore said that during the standoff police negotiators were in conversation with the suspect and "that dialogue resulted in him ultimately handcuffing himself and coming outside and surrendering to SWAT officers." During the armed standoff, a number of people inside the Trader Joe's hid or barricaded themselves in parts of the store to protect themselves from the gunman, Moore said. Department sources told NBC News it started as a domestic incident in the department's Newton Division area south of downtown Saturday afternoon. A vehicle connected to the suspect was subsequently located in Hollywood, and the man allegedly shot at officers, the sources said. Garcetti later confirmed those details, saying police used LoJack technology to track the vehicle. At around 1:30 p.m. a male suspect shot his grandmother and another female, fled in his grandmother's vehicle and took the female with him, Los Angeles police Sgt. Barry Montgomery said earlier. Police gave chase after the vehicle was located in the Hollywood area, officials said. 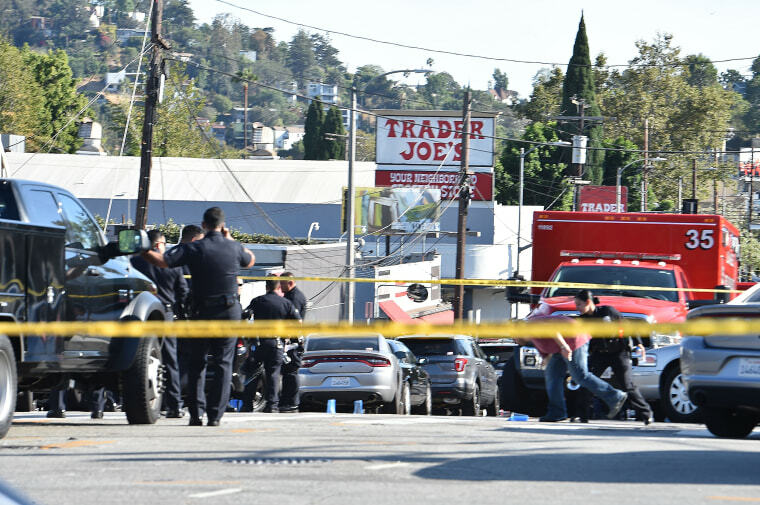 "During the course of that pursuit, the suspect fired on our officers multiple times," Moore said, before ultimately crashing near the Trader Joe's. "As the suspect exited the vehicle there, an additional gun battle ensued between the officers and the suspect." Moore said police believe the suspect kidnapped a woman at the residence on 32nd street where he shot his grandmother, and he put her in that vehicle. The mayor said the suspect allegedly shot at officers through the back window of that sedan as he was chased. Garcetti said the suspect's grandmother was shot seven times. She was recovering Sunday after surgery, NBC Los Angeles reported. The other woman who was shot at the first scene, who was described as Atkins' girlfriend, was grazed by a bullet and was in good condition, Moore said. Relatives of the suspect told NBC Los Angeles that Atkins was living with his grandmother at the time of the attack, as he had since he was 9 years old. Charleo Egland, Atkins' first cousin, said Atkins' life was in a shambles as he had lost his job and two cars recently. "The last thing he told me was 'the next thing I do, I'm going to die doing it or I'm going to jail,'" Egland said. As the situation was unfolding, President Donald Trump on Twitter said he was following developments. The Fire Department said it transported six people for injuries, including the suspect, but none of the injuries were considered to be life threatening. Others were evaluated at the scene and declined hospital treatment. The suspect was described as being in fair condition. Police said that during the gun fight with officers outside the store, he was wounded in the arm. A handgun was recovered from the store, police said. The suspect while in discussions with police made "a series of demands," Moore said, without going into details. Moore said "at all times our hostage negotiators believed that they had established a good rapport with him, a productive one, and one that we believed, in balance, was in efforting to get a peaceful resolution without unnecessarily jeopardizing the hostages further."